The struggle against Israeli apartheid is part of a broader struggle for racial justice, including here in the U.S. As activists in the U.S. we recognize that Israel’s actions are funded and politically and militarily supported by the U.S. government, which is wholly complicit in Israel’s war crimes. We join with all people in the international boycott-divestment-sanctions movement, who struggle for liberation and a just and peaceful world. Outside the Frame is a venue for us to create and explore the culture of queer liberation. Please join us. 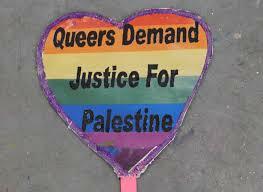 Almost ten years ago, queers who support the Palestinian struggle tried to get Frameline, the San Francisco LGBT film festival, to stop working with, and accepting money from, the Israeli government. This is consistent with the call from hundreds of organizations in Palestinian Civil Society for boycott, divestment and sanctions to oppose the genocidal policies of Israel. Despite emails, postcards, petitions, and protests by the many queers who do not want to partner with the Israeli government, Frameline has refused to seriously consider this issue. Israel was officially formed in 1948, but well before that time, organized militias carried out genocidal attacks against Palestinians, expelling people, destroying villages and taking land. We have seen that the Israeli government has no intention of negotiating with Palestinians because the Israeli government has built an Apartheid wall and continues to create new settlements on Palestinian territory. These practices continue to this day – as shown by the killing of over 3,000 Palestinians in Gaza and the West Bank earlier this year. This latest genocide makes it all the more important for Frameline to discontinue their complicity with Pinkwashing. Over the years, Frameline has grown more intransigent in its decision to maintain its relationship with the Israeli government, just this year refusing to meet with Arab queers and allies about this topic. We are heartened by an increasing number of filmmakers refusing to submit their films, or who have withdrawn their films from Frameline’s annual festival or from Frameline distribution.